For a while now I’ve wanted a phone with multiple cameras, so it was probably inevitable that I’d get the S10 when it came out. In fact, I went the whole hog and got the S10+. Although I generally prefer slightly smaller phones, the S10 itself was bigger than the previous generation, so I thought I might as well go all the way and try a bigger phone this time round. It didn’t feel unmanageable in the shop, and side by side with the S10 it doesn’t look much wider. In regular use, though, those few millimetres make all the difference, and I am finding it a bit of a handful. I think it’s something I’ll get used to, as I adjust my grip to take the size into account. There is one major ergonomic problem with the phone, and that’s the placement of the power button. It’s so high on the right hand side that it’s a real stretch to reach. The only way I can reach the button is by shifting the phone in my hand, increasing the risk of dropping it. It’s ironic that Samsung has made much of the fact that its One UI software places on screen controls at the bottom, within easy reach, but at the same time has put the physical power button almost out of reach. Otherwise it’s a typical Samsung flagship. Great build, fantastic screen and with features missing from many competitors, such as a MicroSD slot and 3.5mm headphone jack. Other than the camera setup, which I’ll cover in more detail in future posts, the main new feature is the under screen fingerprint scanner. Unfortunately, it’s not great. On the S8 and S9, I found the rear fingerprint scanner to be absolutely reliable and very fast. 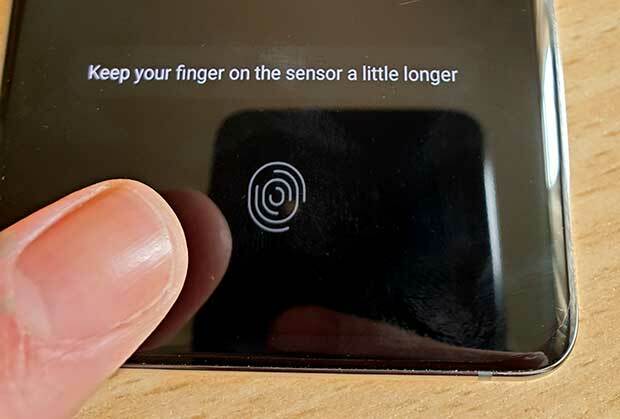 The S10+’s under screen scanner reminds me of the first fingerprint scanner I used, back on the Samsung S6. It’s finicky to set up, slow to use and not particularly reliable. My hitrate for unlocking first time is probably less than 50%. There’s definitely a knack to it, and I’m getting a bit better, but I still have to think about it every time to make sure I’m pressing hard enough and in the right place. 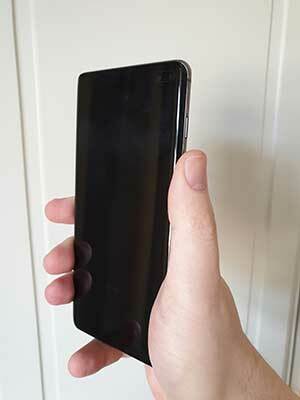 The phone came with a factory fitted screen protector, and some reports suggest that the fingerprint scanner works best with it removed, but I’m reluctant to take that step. I’m hoping that it will improve with software updates, but so far it’s a disappointment. I guess that’s the price you pay for being an early adopter of the first generation of a new technology. The S10+ also lacks an LED notification light, and I really miss it. The always on display is a poor substitute, as it does have a noticeable impact on battery life and it’s harder to see at a glance when there are new notifications. I have a Galaxy watch, so it’s not an issue when I’m wearing it, but I tend to take it off at home and that’s when I miss the clear pulsing notification light. Those are the downsides, so what about the positives? The 4100mAh battery is a big step up from my previous phones. With light use I can get nearly two days out of it, and I have no worries about leaving the house for a normal day at work with the phone at 50%, safe in the knowledge that it’ll last until I get home. I had my doubts about the camera hole punch, Samsung’s alternative to a notch, especially as it makes the notification information asymmetrical. I still think it would look better if it was in the middle of the screen, but in practice I’ve been surprised by how little it bothers me. I wouldn’t say it’s better than a small notch, but in normal use I barely notice it. My initial quick tests of the camera were generally positive, and the ultra wide view looks amazing. i’ve yet to truly put it through its paces – there’s only so much you can do with miserable weather – but it looks at least as good as the S9 with additional flexibility. This is also the first Samsung phone I’ve had where I haven’t felt the need to install Nova Launcher. The OneUI launcher is meeting my needs, even though the new icons don’t look as good as the older ones. Sticking with OneUI also inspired me to try an experiment. With my previous Samsung phones, I avoided the Samsung software as much as possible and installed the Google equivalents – keyboard, SMS app, calendar, even the calculator. With the S10+ I’ve decided to give Samsung’s software a real try. I’ve even set up Samsung Pay rather than Google Pay, to fully experience the Samsung ecosystem. The results are mixed, but I’m sticking with it for a while. Overall, then, the S10+ is a mixed bag and I’m slightly disappointed. The fingerprint sensor is the main problem. If that was as good as the old sensors then I’d be happy. The lack of an LED light is only a slight annoyance in comparison. I’ll follow up with the camera test and the results of using the Samsung software in a few weeks when I’ve had a chance to really live with the phone.